Growing up in what we could call a “normal” family, – not poor but definitely not wealthy – , money was never a matter before the economic crisis that spread through Europe in 2007 and 2008. Then my parents started to pay a bit more attention to the cost of things they bought. Now, I’ve reached adulthood, and I’m starting to have money responsabilities : bank account, payment card, checks, etc. My 18th birthday was about a month ago, and for that special occasion I received 100€ from my godmother. I thank her for that, but in the meantime, that insidious question appeared : should I spend it on things I like or want, or should I put in in my bank account and let it sleep there for a while ?! If I was to spend it, wouldn’t I become crazy about it, wouldn’t I become a superficial materialistic kind of person ? A few months ago, I came across that quote : “Power tends to corrupt, and absolute power corrupts absolutely” (Lord Acton). Now, it appears that money could be that kind of power, which is also quite obvious, because we live in a capitalistic, globalized world in which leaders are in some cases at the feet of lobbyists. When I thought about spending that money, my first thought was to buy sport clothes, so I can exercise better and more, which meant I could be fitter and feel better about myself. But then, second thought : wouldn’t I be driven to use overexercise as a way to punish myself, only to be relieved by the dopamine at the end of the workout?! Would I use this money in a great way then ? It could please myself and make me feel socially great but in the same time hurt me. Great dilemma. It’s the story of a monopoly game in which the kids change their behaviors and game strategy when they are confronted to real money. I’m very happy today to share today’s prompt, something I haven’t done for a very long time and it’s a part of why I’m so happy do retry this writing exercise. We’re in a a world where borders have always been a problem. Since the ancient times, kingdoms have always had the will to push their borders accross another country and to invade them. Religion was helping during Middle Age, as religions and civil wars spread across the Old Continent. Asia wasn’t spared either during all the conflicts between China and Japan. The two World Wars are also an example of this, Belgium borders didn’t count anymore for the german army who used that country to go to France. Hitler, with the Anschluss, invaded Poland. And the same things repeat again and again, to the world we know today, and with the migrants crisis all over the world. Everyone knows, “music is life” for the majority of the Earth’s inhabitants. Created from the very beginning, music has always taken a major place in a civilization’s culture. Homo Sapiens, Homo Neanderthalensis and the people from those early civilization are the ones who started playing music, often with bone-caved flutes, but mankind have never cesed to try different rythms and sounds, making discoveries about how the sound is created, and so how the instruments must be built. Apart from birds, whales and a few other which we know, according to science, use a kind of primitive music to communicate, humans is the only “developed” species that have made music. The special features for which we continue to make music over the centuries, is that it’s made only to be a form of art, and so to be “esthetic” even if some artists consider they don’t make music for it to be esthetic). Then, we created lyrics, used our own voices to be a new instrument, each voice being very unique, and guiding words through melody. It amazes me how humans have this possibility, this creativity wide enough to always be able to find new rythms, new lyrics, new themes, new topics to sing about. One common belief is to say that anorexics are always (too) thin and that bulimics are only fat girls that eat too much. Because yes, as you know, guys have no place in eating disorder representation. And that’s the first shame here about it. Actually, even if the major proportion of people who have EDs are girls, guys also experiment these illnesses. To give figures, there’s 1 out of 10 males in sufferers. And the open-minded me is really troubled by this fact, as we know for instance anorexia nervosa is the most deadly mental disorder. This under-representation of male sufferers is terrible and we need to fight against that. Anyone who suffered from an eating disorder knows what I’m talking about. And if I was a guy, I don’t think I’d like someone to consider I’m only dieting when my attitude towards food (and myself) puts me in danger, that this someone doesn’t believe that I’ve got an ED just because of my gender. Men get eating disorders too. Now, I’m a girl, and I experienced an eating disorder. I haven’t been diagnosed but with some distance now I can tell that those few month in my life had been my worst nightmare, and that I was probably struggling with an eating disorder. The only thing is, when I just look at it, at some point I think “Well, you can’t have had an ED, you’re far too fat…”. And I actually was at the beginning, until I dropped 10kgs and got to a “normal” weight. Overweights get eating disorders too. And no one thinks about them. That’s the second shame of people’s misconception about EDs. Some researchers, clinicians, psychiatrists start to consider overweights as people who can possibly have an ED, but unluckily those doctors aren’t enough to change people’s view of it. I wish at the time I got ill that some doctor, someone, told me I was really struggling with some ED. Unfortunately no one did, but you who read this post, you hold a great power to make them reconsider how they think about eating disorder sufferers. You have that power, because today, you can talk about it to your family, friends, relatives and help spread the word. Overweights get eating disorder too. After Candy Crush and Flappy Bird, the new popular game is 2048. For those who don’t know it, you only must pile tiles which have the same number (from 2 up to 1024) and when you manage making a 2028 block, you win the game! Only guess what? 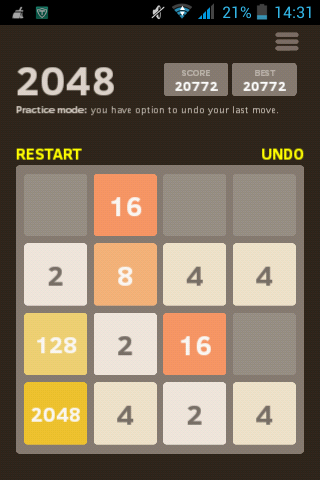 It was only a week I downloaded it from the Play store ( you can also download it from the following link : http://2048.mobi/download/ ) , I played as usual, thinking there was no chance I win, and suddenly … two 1024 appeared ! I won! I was so happy you can’t imagine! After only a week practicing I managed ! I’m havin’ so much fun playing this game ! I really recommend this game! Who will do it faster than I did? Let’s see! Hope you liked that article, and that this video has made you think about this whole world, in which you can be having a great shower with heated water while people die of hunger in other countries, or even in your city.